Caricature has always been a dangerous business in France: starting from the earliest days of political or religious caricature during the Age of Enlightenment, caricature artists have risked fines, imprisonment and worse–torture, beatings, assassination. Nothing sacred? Perhaps. Or perhaps when nothing is beyond satire everything is equally sacred? "Equal" is the key term. A sense of humor is essential. Clearly not all peoples, nations and creeds possess the same sense of humor–or possess the capacity to develop one. 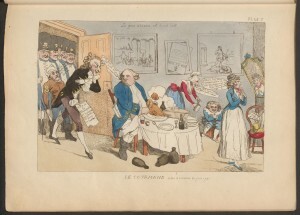 Paris was and remains the homeland of the French caricature and it was in Paris during the Revolutionary period that the caricature came into its own as a vehicle to attack the aristocracy and the church. Later, the original "terrorists" of The Terror–those masters of the mock trail and the guillotine–fell victim to caricature and beheading. Napoleon rose through the ranks and kept his head on his shoulders, eventually becoming emperor. But he too was the target of political satire and savage caricature, and was ousted from power (the number of caricatures of him skyrocketed). The heyday of caricature came with the end of the restored Bourbon monarchs and the death of Charles X, an aspiring theocrat: he wanted to turn the clock back to the ancien regime and reinstitute divine right monarchy. When he repealed press freedom in 1830 all hell broke loose–aided by the rebellious Romantics with a capital R rallied by Victor Hugo after the so-called Battle of Hernani. Politics, religion, literature, art, science, medicine, fashion, family life and marriage… everything was and is fair game.